The limited edition 16 page Stern specimen booklet tells the story of the making of the font that is shown being made in the Making Faces film. The booklet was printed by legendary printers, Coach House Press in Toronto. The black & white photos by Anna Prior are printed in warm grey & black duotone with silver highlights in the specimen portions that accent the feel of the type & tools used to make Stern. 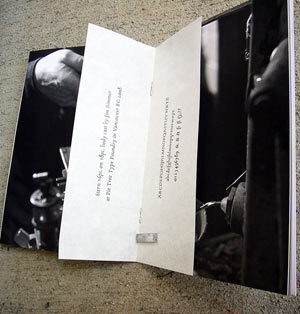 Included is a bound-in letterpress specimen also printed at Coach House on Japanese rice paper. 5" x 7". 1250 copies printed in 2008, Text by Brian Maloney, Design by Richard Kegler. 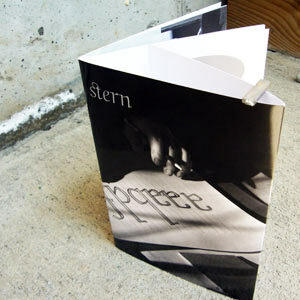 This specimen booklet is $5 while supplies last or sent free with purchase of Stern Pro font. 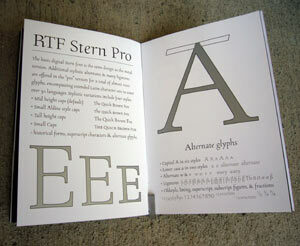 The current version of Stern Pro is an expanded version of the font shown in this booklet.